Click here to download handouts and reference cards for this web page. 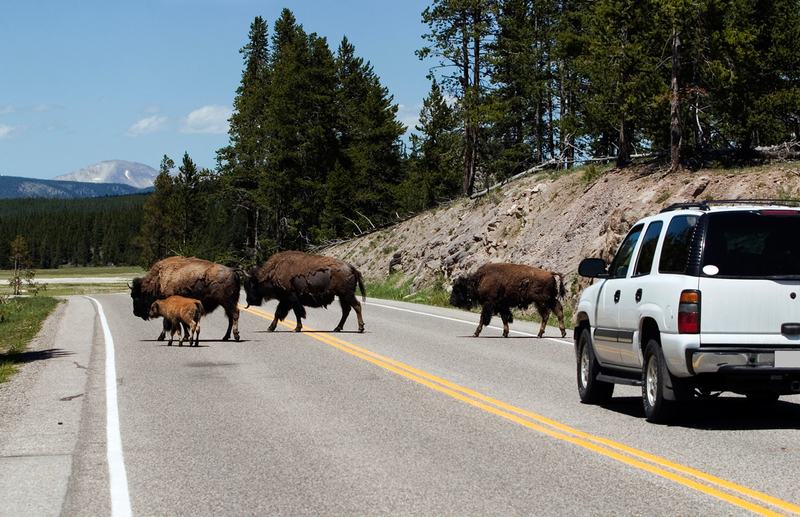 Collisions between wildlife and vehicles can be extremely hazardous and have deadly consequences for both people and animals. Furthermore, more collisions are caused by drivers hitting other vehicles or losing control of their own vehicle when they swerve to avoid collisions with animals. 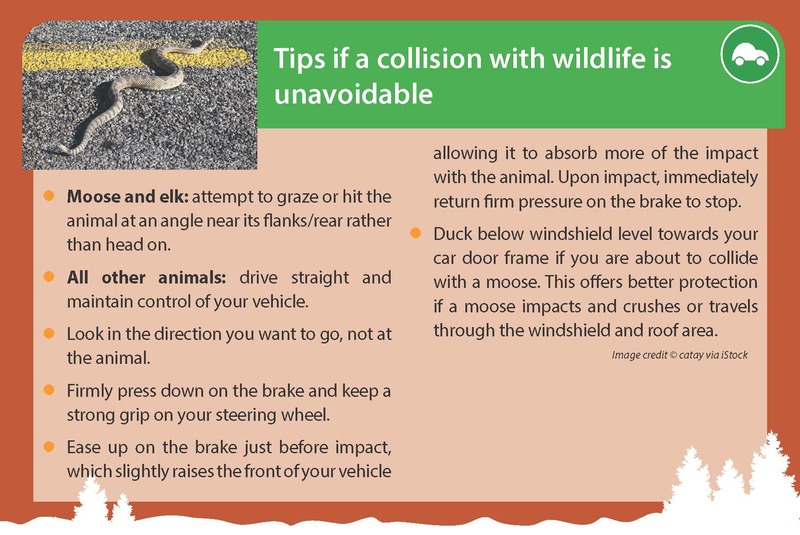 This web page provides information and road safety tips to help drivers be better prepared to avoid or respond to a potential collision with wildlife. Click on a banner below to learn more. Roads often divide animal habitats and act like a barrier to movements associated with the various needs of wildlife such as water and food sources or migration and mating activities. Wildlife will cross roads to reach these destinations; however, their natural defences designed to act against predators are not very useful to protect them from or to help them avoid vehicles. Roads offer easy walking and wide spaces for animals to move around particularly in the winter when it is difficult to move through deep snow. In the summer, the breeziness of open roads helps keep insects off animals. 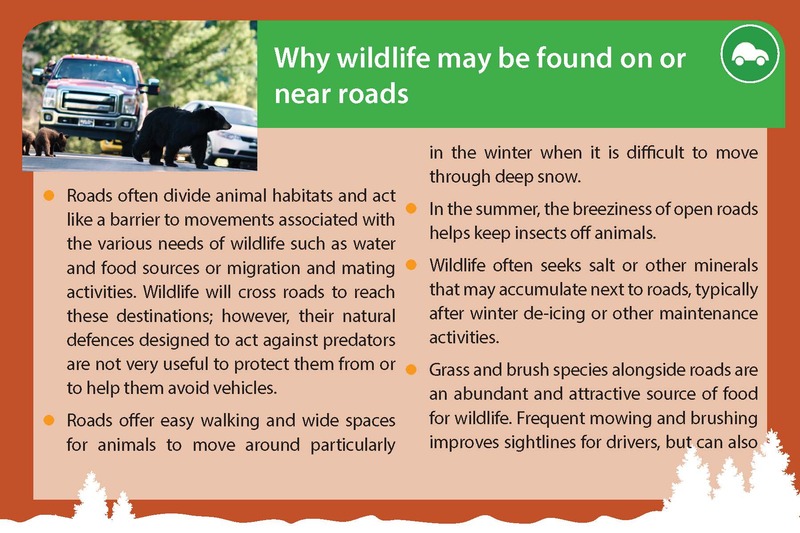 Wildlife often seeks salt or other minerals that may accumulate next to roads, typically after winter de-icing or other maintenance activities. Grass and brush alongside roads are an abundant and attractive source of food for wildlife. Frequent mowing and brushing improves sightlines for drivers, but can also cause vigorous re-sprouting which is very attractive to some wildlife species. Litter thrown or fallen from vehicles that accumulates beside roads can attract wildlife. Some smaller wildlife make their homes or nesting areas in the ditches alongside roads, preferring the dry dirt, short grass, or water that ditches or road banks often provide. Agricultural crops that grow next to roads can offer easy access to food for animals as well as may have concentrations of waste grain near roads after transport. In particular, deer, moose, and bears prefer food along the edges of vegetation. Scavengers such as vultures or small carnivores will patrol roads with heavy roadkill for vehicle-killed animals, increasing the number of wildlife on or around roads. Think about how you should respond to potential collisions! 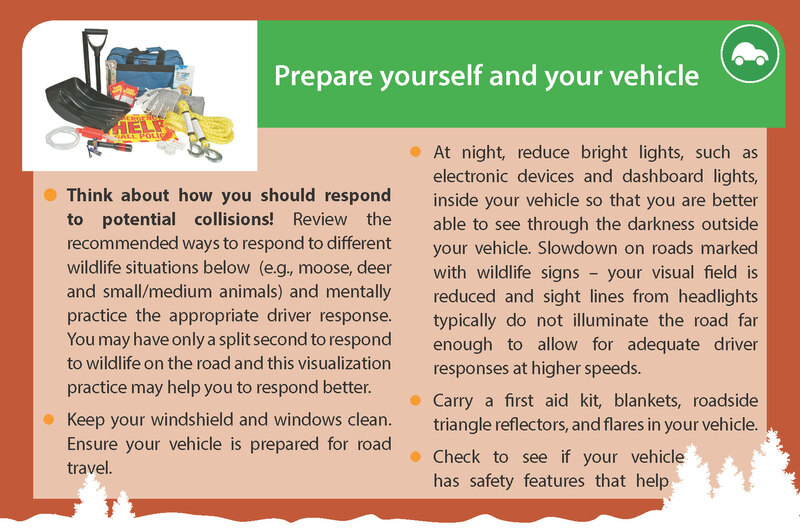 Review the recommended ways to respond to different wildlife situations below (e.g., moose, deer and small/medium animals) and mentally practice the appropriate driver response. You may have only a split second to respond to wildlife on the road and this visualization practice may help you to respond better. Keep your windshield and windows clean. Ensure your vehicle is prepared for road travel. At night, reduce bright lights, such as electronic devices and dashboard lights, inside your vehicle so that you are better able to see through the darkness outside your vehicle. Slowdown on roads marked with wildlife signs – your visual field is reduced and sight lines from headlights typically do not illuminate the road far enough to allow for adequate driver responses at higher speeds. Carry a first aid kit, blankets, roadside triangle reflectors, and flares in your vehicle. Check to see if your vehicle has safety features that help improve driver responses. A wide range of features are available for different vehicles such as electronic stability control (which can aid drivers in maintaining control of their vehicle during emergency manoeuvers), forward collision warning systems (which help alert drivers to objects in the path of the vehicle), or brake assist (which helps drivers to stop more quickly). Keep in mind safety features do not replace drivers and many require the driver to respond to a situation (e.g., braking) before the feature will engage. Make sure you know how to use them properly and their limitations. Check out Brain on Board (www.brainonboard.ca ) for more information on safety features. The best course of action is to slow down in wildlife inhabited areas especially where signs are posted, be alert to the road environment, and mentally rehearse your reaction to different potential collision scenarios. on two-lane highways with speeds of 80 km/h or more. Plan your travel to avoid the above situations to greatly reduce your risk of hitting an animal. Be prepared for additional animals following the first one you see. When you see wildlife, immediately scan the environment for other animals as many travel in groups. Be particularly careful at the ends of fences as this is where many animals cross roads. Be cautious of wildlife standing calmly alongside roads. They can bolt at any moment if frightened. Drive defensively. Other drivers may not know how to react properly to wildlife on the road and could swerve into you. Know and use your vehicle’s safety features such as seatbelts and headlights. Take extra precautions if you are a motorcycle rider or travelling in smaller vehicles. Scan your surroundings constantly. Watch for movement and, at night, for the reflective glow in the eyes of some animals. Watch for wildlife warning signs. They are placed in high wildlife crossing and collision areas. Watch for flickering lights from other vehicles, which may indicate an animal crossing the road between the other vehicle and you. Watch for other vehicles pulled over or that suddenly slow down. It is possible other drivers have spotted wildlife that you are not yet able to see. Ask passengers to watch for wildlife and give specific observations such as, “deer on left”. Do not drive fatigued, impaired, or distracted. Do not speed in wildlife areas and, when traffic levels are low, try to drive at the lower end of the speed limit or just below the limit, if it is safe to do so. This will provide you with an extra few seconds to spot animals and respond if an animal suddenly appears. Do not rely on roadside fencing to protect you. Some animals can jump over or crawl under fences. Do not litter as this attracts animals to the roadside. Roads and vehicles are not part of the natural environment; therefore, the automatic defences of animals are not well-adapted to the dangers roads pose (e.g., deer and moose have difficulty judging speeds of approaching vehicles and may not flee, turtles retreat into their shells). Experts in different fields provide different advice about ways for drivers to respond when animals are on the road. There is no one single correct way in which to respond for every circumstance. Drivers must always be alert and be prepared to respond to different situations. animals may run off of the road in any direction. If you decide to flash your lights, ensure that you flash them completely off and not just to the dim setting. The eyes of some animals, particularly deer, can be over-stimulated by the presence of any light; therefore, flashing lights to off allows their eyes to partially recover from sensory overload, where they may then move. Take your foot off the gas, immediately reduce speed by easing on the brake, and stay in control of your vehicle. Do NOT swerve. Most drivers either lose control of their vehicle or crash into other vehicles or roadside hazard in an attempt to avoid an animal. The one potential exception is with moose in light of their large size and heavy weight; see below for recommendations. Other road users: do not swerve. If other road users (e.g., pedestrians, cyclists, or vehicles) are nearby, experts recommend that you hit the animal. If you swerve, you may hit other road users; and, vehicles behind you or in oncoming lanes are likely to react to your evasive manoeuvres with dangerous actions of their own, possibly causing a collision. Hitting another vehicle/road user is always more dangerous than hitting an animal. Deer: do not swerve. Steer straight towards the deer, take your foot off the gas, immediately reduce speed by easing on the brake, and stay in control of your vehicle. The natural tendency of deer is to dart in an unpredictable direction and chances are they will not remain where they are standing. 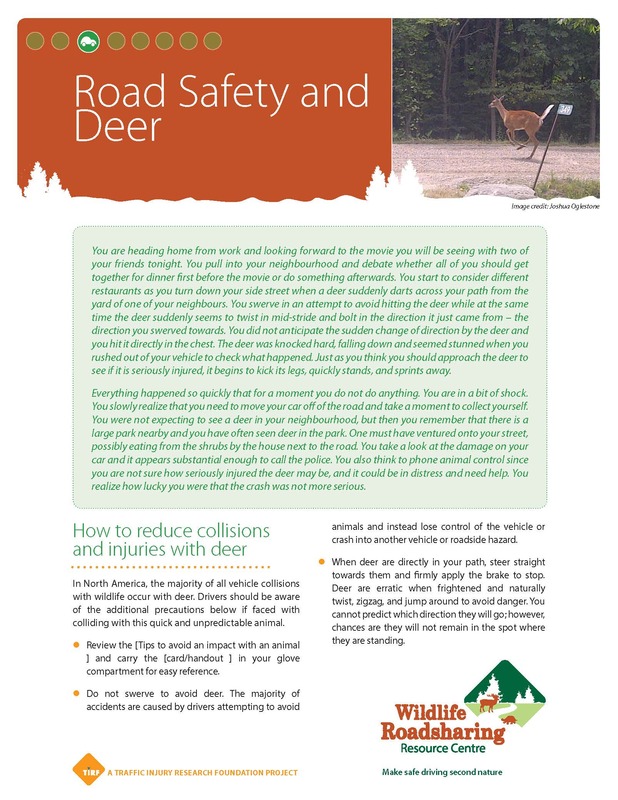 Download the Road Safety and Deer Handout for more information. Some experts state that you should never swerve. Hitting another road user (e.g., car, cyclist) or road hazard (e.g., boulder, cliff) could be just as dangerous and damaging as hitting the moose. Aim your vehicle at the flanks (rear) of the moose in order to try for a glancing blow. Some experts state that you should swerve in certain situations and aim your vehicle towards the flanks (rear) of the moose. Due to the weight of moose (similar to a small car) and that the majority of their body weight sits higher than the hood/impact zone of most vehicles, hitting a moose straight often results in the moose sliding across the hood and crushing the roof of the passenger compartment which can be fatal. What the above two options mean is that as a driver, you must pay close attention to your driving environment, be aware of other road users and road hazards, and make the best decision for you and other road users in order to respond to a potential impact with moose/elk. 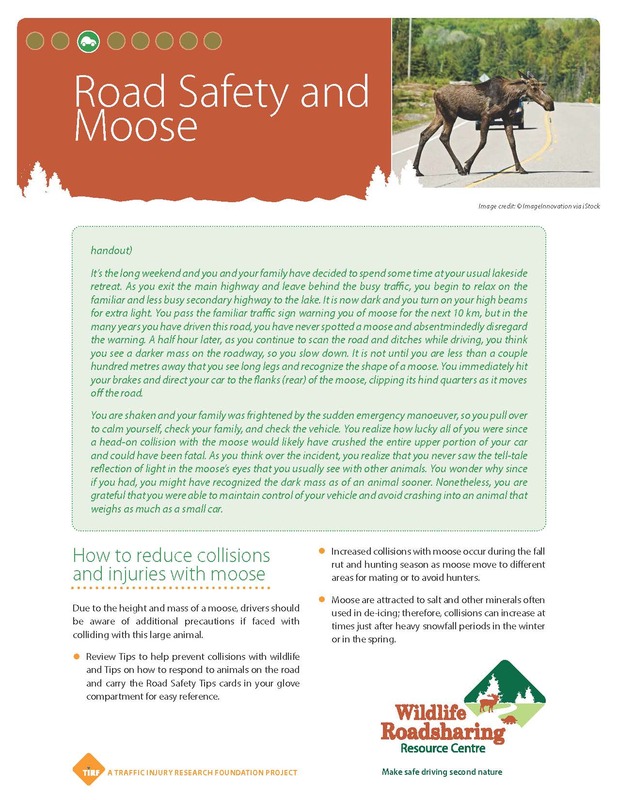 Download the Road Safety and Moose Handout for more information. Herd or pack: do not swerve. Take your foot off the gas, immediately reduce speed by easing on the brake, and stay in control of your vehicle. Small animals: do not swerve. Drive straight and ease off of the gas if it is safe and possible to do so. Hitting another vehicle/road user/road hazard is always more dangerous than hitting an animal. Slamming on your brakes may also cause vehicles behind you to crash into you, especially as other drivers may not see the animal and not be prepared to stop. Agile animals may attempt to avoid you if you travel in a straight and predictable manner; slower animals may be able to pass under your vehicle if you can make a slight but safe adjustment to the position of your tires. 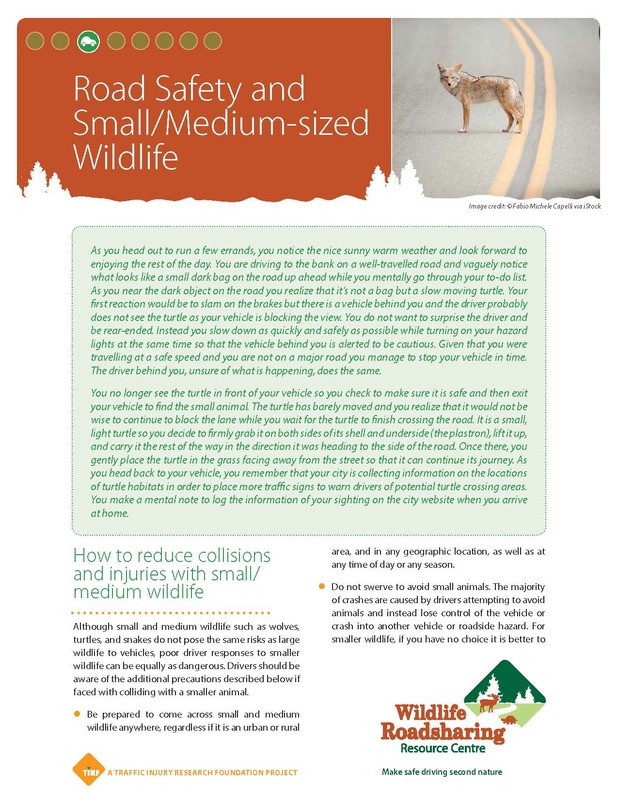 Download the Road Safety and Small/Medium Wildlife handout for more information. Be prepared for animals to turn around even if they have already crossed the road. Something may cause them to return, such as being spooked by oncoming traffic. Be cautious if animals are on the other side of the road. 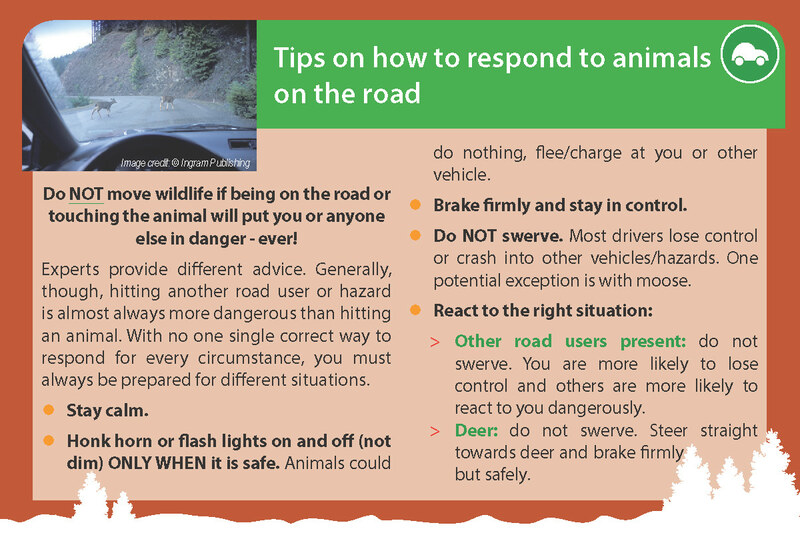 They may dart to your side of the road, another vehicle could scare or hit the animal into your path, drivers in other vehicles may make evasive manoeuvres that put you and/or other road users at risk, and other wildlife may be nearby. Moose and elk: attempt to graze or hit the animal at an angle near its flanks/rear rather than head on. All other animals: drive straight and maintain control of your vehicle. Look in the direction you want to go, not at the animal. Take your foot off the gas, immediately reduce speed by easing on the brake, and keep a strong grip on your steering wheel. Ease up on the brake just before impact, which slightly raises the front of your vehicle allowing it to absorb more of the impact with the animal. Upon impact, immediately return firm pressure on the brake to stop. Duck below windshield level towards your car door frame if you are about to collide with a moose. This offers better protection if a moose impacts and crushes or travels through the windshield and roof area. Pull your vehicle over if feasible, turn on your hazard lights, and shine your headlights on the animal if possible. Check yourself and fellow passengers for injuries. As shock sets in, body temperatures drop. Those involved in the collision should put on extra clothing (e.g., sweater) and/or wrap themselves in blankets. Call 911 if anyone suffered injuries. Keep in mind that shock may prevent people from realizing that they have an injury that requires attention. Do not drive away. Even if there are no injuries check your vehicle. There could be damage, particularly underneath, to wheel alignment, or along the front impact zone (bumper area) of your vehicle that could affect its performance and/or safety. Set out roadside reflector triangles or flares to warn other motorists of the hazard on the road, or use other light sources if you do not have these items. Remember that you have a duty to ensure that your accident does not cause a hazard for other drivers. 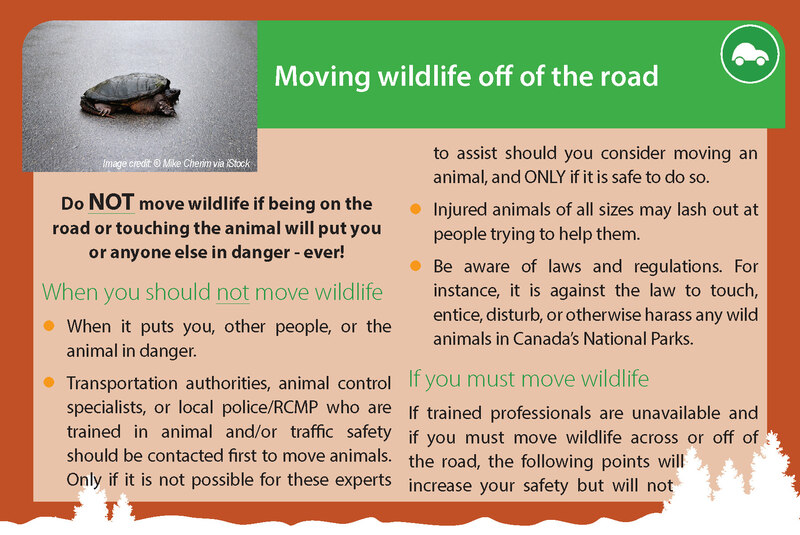 If possible and only if it is safe to do so, move small animals off to the side of the road. Do not attempt to approach animals that are still alive. Injured and frightened animals may continue to flail and can cause serious injuries to people. You are not required to put an injured animal out of its misery or move a dead animal and some jurisdictions may have laws against this practice. Contact local authorities or wildlife/animal rehabilitation/rescue organizations for advice on what to do. Even if there are no injuries or serious damages, hitting an animal can be a shock. Take the time to calm yourself and others as well as assess the situation. Report collisions to the police/RCMP if warranted and the local or provincial animal control/conservation offices. 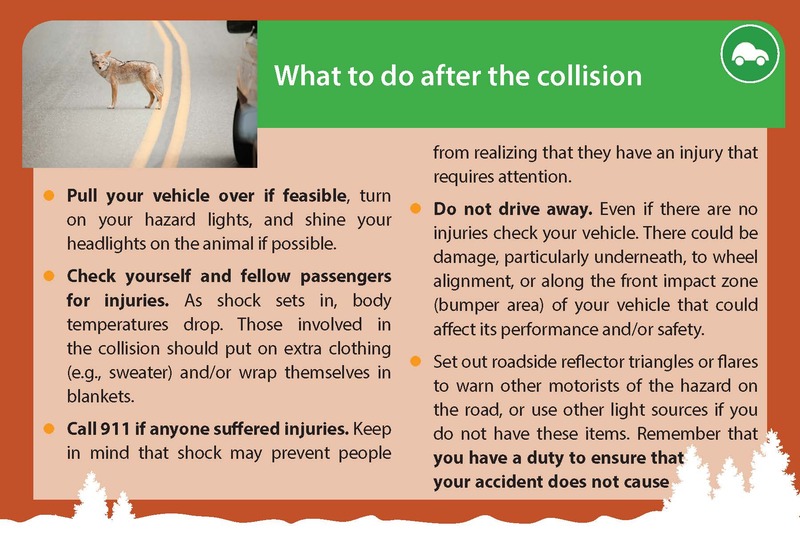 Click on the images below to download handouts and quick reference cards concerning road safety and specific animals. 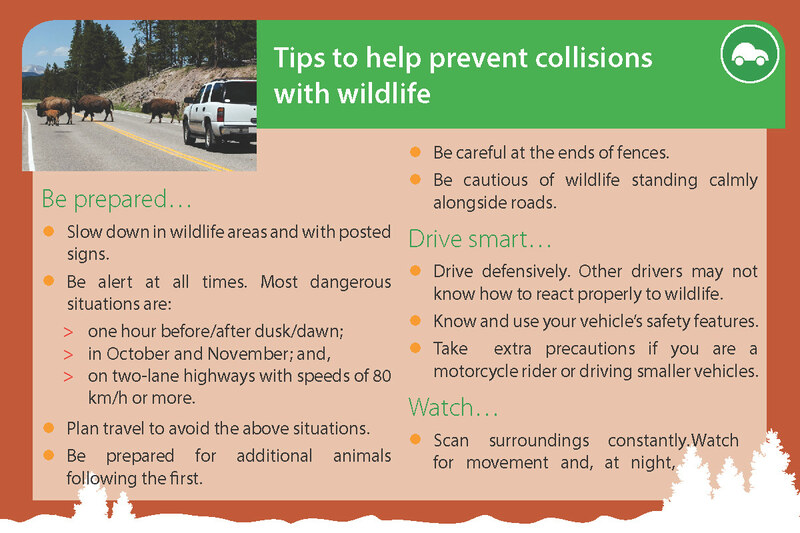 Tips to Prevent and Handle Collisions with Wildlife. Store in your glove compartment. Bradford, L. (2003). Road mortality effects on the turtle population at St. Lawrence Islands National Park. Protected Areas and Watershed Management, 443-447.Danks, Z.D., and Porter, W.F. (2010). Temporal, spatial, and landscape habitat characteristics of moose-vehicle collisions in Western Maine. The Journal of Wildlife Management, 74(6), 1229-1241. Mastro, L. L., Conover, M. R. and Frey, S. N. (2008). Deer–vehicle collision prevention techniques. Human-Wildlife Conflicts. 2(1), 80-92. Ng, J. W, Nielson, C. and St. Clair, C.C (2008). Landscape and traffic factors influencing deer-vehicle collisions in an urban environment. Human-Wildlife Interactions, 2(1), 34-47.